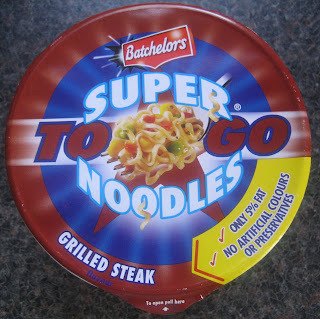 Batchelors have recently introduced the Super Noodles To Go line to compete with the Pot Noodle franchise in the cup noodles department. I usually try to avoid this type of instant noodle for a couple reasons. First, the noodles tend to be very inferior; I don't know why this has to be the case, but these cup noodles are always filled with puny tasteless noodles. The second reason I usually avoid these noodles is that they are a complete waste of packaging and usually include non-recyclable styrofoam. With that said, I couldn't pass up this cup of Grilled Steak Flavour, as this is a flavor that Super Noodles doesn't make in the brick form. True to form, the noodles inside are the crappy thin strings that are found in cup noodles across the world. How hard would it be to put some decent noodles in there? I don't know why they don't just put their regular noodles in, since Super Noodles make some pretty good noodles in brick form. Perhaps they need the noodles to be thin so that they cook very easily, even when the water isn't quite boiling. 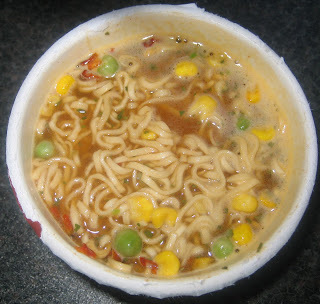 Block form Super Noodles aren't meant to be eaten with broth, but this cup of noodles was designed to include broth. I was pleasantly surprised that the broth was beefy and savory. The dried sweet peas and corn were a nice touch as well, although hardly surprising for this type of product. To be honest, this was one of the better cup style instant noodles that I've had. However, they just don't hold a candle to a good brick style instant noodle package.